At 28, Micah Keating is fresh out of law school and traveling back to Hong Kong to start his new law career at one of the country’s top firms. On his first day, Micah meets Brenda, the daughter of his boss, Garret Southam. Micah is immediately smitten, but Brenda, having grown up around lawyers, is less than impressed. The two are assigned a seemingly boring – but multi-billion dollar – client. It soon becomes clear that not all is what it seems and that Garret is the attorney for Chin, a Triad leader and psychopathic Shaolin kung fu master, and Micah and Brenda’s client is actually a cover for Chin’s dealings. In addition, Garret and his best friend Tommy (father to Brenda’s best friend Abby) have ripped off the crime boss for billions of dollars. The only thing keeping Garret alive is his extensive and exclusive knowledge of Chin’s empire, but to force his hand, Chin abducts Brenda. To find and free his new lady love, Micah must transform himself from the awkward, romantic son of missionaries to an untamed animal even Chin will fear. 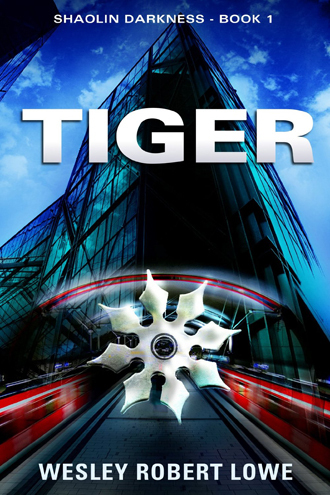 “Tiger” is action packed from the beginning – from a foot chase between Chin and a Bengal tiger on the busy streets of Hong Kong, hand-to-hand combat between various characters, there is rarely a dull moment. Readers will be on the edge of their seats throughout the story as they read to find out what happens with Brenda, Garret, Micah, Abby and the rest of the characters – even the Bengal tiger. And in between those action-packed moments, Lowe does a great job of showing who the characters are. Through stories from their past as well as interactions with others, we see that each character is their own person, with individual thoughts and opinions and hopes and dreams. We learn how they became who they are and root for them to succeed. During the Vietnam War, there were many things at work. From the soldiers on the front lines in Vietnam, to the politicians in Washington D.C. working to control the strings, to the members of the press whose coverage of the war swayed public opinion, there was not one single thing that drove things. 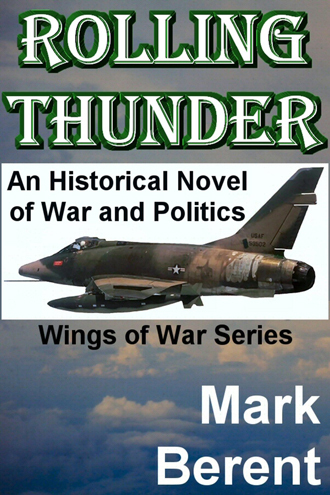 “Rolling Thunder” is a story about how all of these elements – and more – came together to become the war often referred to as “Nam.” The story takes place from 1965-66 and covers the points of views from various characters. However, it particularly follows three men: Court Bannister, a U.S. Air Force captain who is often overshadowed by a movie star father who fought in WWII; Toby Parker, a first lieutenant in the air force who hooks up with an intelligence unit on a whim and gets a up-close view of the dangers of war; and finally, Wolf Lochert, a colonel in the Special Forces who ventures into the jungle to rescue a downed pilot. Admittedly, I did not know much about the Vietnam War prior to reading “Rolling Thunder.” It was not something that was covered extensively in school. Through this story – the first in his “Wings of War” series – Berent, who served three tours in Vietnam, shares his knowledge of one of the most controversial moments in modern history. He shows us the complexity of the war and how it was fought equally overseas and behind closed doors. The story takes place in the war zones of Vietnam such as Saigon, Hanoi, Bien How, Da Nang and Tahkli. Berent shows readers his experience as his action scenes in the air and on land are filled with rich details. And while there are moments when his attention to detail – such as that regarding the various planes in the story – sometimes slow down the story, it just once again proves Berent’s extensive knowledge of the subject. Poke Rafferty is back in this second installment of the thriller series that bears his name. In this story, Poke is settling into the domestic life with his fiancée Rose and his newly adopted daughter, Miaow. Together, the trio has formed a small – if odd – family comprised of an American travel writer, a former go-go dancer who used to work at one of Bangkok’s most famous bars and a former street child. But their pleasant way of life is soon interrupted after someone from Poke’s past reenters his life – and not for the better. With this individual has comes trouble, including one of the most dangerous gangsters in China, which now threatens Poke’s newly formed family. In addition, Rose has found herself innocently in the middle of a North Korean counterfeiting operation and at the center of scrutiny from an especially determined U.S. Secret Service agent. While Poke may be the title character in the series, he is in no way, the only character. Hallinan has done a great job in creating multi-faceted characters – from the other two members of Poke’s family, to his police officer friend Arthit, to his former spy friend Arnold Prettyman, everyone has a story that readers will want to know. 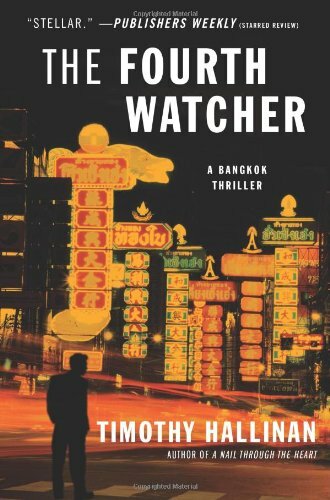 Another thing I enjoyed about “Fourth Watcher” was how there was more than one storyline – just as there are in real life. The characters have many things they have to deal with and seeing them struggling to deal with everything coming at them just makes them that much more human to readers.